I left the facility with a strong desire to wash my hands, perhaps to shed any trace of horror in my body. Yet as an Argentine, how could I not be implicated in the history of state violence that still haunts the nation? More than two decades after the last military dictatorship in Argentina ended (1976-1983), its legacy of terror is still an open wound. In the name of national security and of defending Western Civilization from the threat of leftist “subversion,” the military regime tortured and “disappeared” tens of thousands of people. One emblematic site of such practices is the E.S.M.A. (Escuela de Mecánica de la Armada, School of Naval Mechanics), a facility I gained access to in 2007 as part of a guided visit. The E.S.M.A. 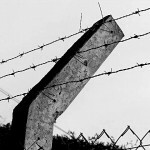 was among around 500 facilities turned into clandestine detention centers during Argentina’s dictatorship. It operated as a concentration camp, torture center, and platform from which detainees were taken on “death flights” to be thrown into the ocean or river to drown. Now open to the public and managed by human rights groups, the E.S.M.A. has been transformed into a “Space of Memory and for the Promotion and Defense of Human Rights.” As I left the E.S.M.A., the cold, humid quality of the buildings seemed to have penetrated my bones. The screams of the people subjected to torment remained in the silent walls. Reverberating in my head were the words capucha (hood) and capuchita (little hood) (rooms where detainees were kept shackled with eyes covered), “avenue of happiness” (corridor in a torture area), and “the Sardá” (a small room—named after the Maternity Sardá—where pregnant detainees gave birth, only to have their babies taken away). The military regime’s penchant for twisting the meanings of words mirrored its systematic distortion of other aspects of reality. After all, what is the meaning of security when a government brutally turns against its own population? 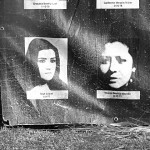 The experience of state terrorism in Argentina embodies social suffering which anthropologists Arthur Kleinman, Veena Das, and Margaret Lock say stems from “what political, economic, and institutional power does to people, and, reciprocally, from how these forms of power themselves influence responses to social problems.” How do people collectively struggle with trauma related to state-sponsored atrocities? How do movements seek to redress such events? The following pictures feature various strategies of memorialization linked with the goal of bringing about truth and justice. The photo essay focuses on four sites in Buenos Aires, Argentina: the Park of Memory and the Human Rights Walk (places of remembrance and tribute to the victims of state terrorism) and the E.S.M.A. and “Olimpo” (former clandestine detention centers, now refashioned by human rights organizations). The pictures illustrate the diverse methods human rights advocates use to raise awareness, construct memory, and garner political support: testimony, displays, public art, and cultural events that build cross-movement solidarity. Above all, these images capture the critical roles that the reclamation and resignification of formerly terrifying physical spaces play in grappling with social suffering and human rights. Barbara Sutton is in the women’s studies department at the University at Albany, State University of New York. She is the author of Bodies in Crisis: Culture, Violence, and Women’s Resistance in Neoliberal Argentina.